Echeveria ‘Dark Vader’ with its upward turned foliage is one of the more unusual succulents available. The new foliage emerges a mid green, and as the plant matures and the succulent is stressed it turns a a much darker shade towards a deep red to black with red margins. The deep greens and reds of this mound forming make it a standout in any collection. This is a hybrid between ‘Top Turvy’ and ‘Black Prince’. The plant itself will reach to around 20 cm in height (8 inches) with a similar spread. Foliage is best described as a blue green, and slightly recurved. This cultivar was developed in Taiwan, a little more difficult to propagate than most, however also one of the more outstanding forms available. Although this is a rare cultivar it is easy to grow in the right conditions. 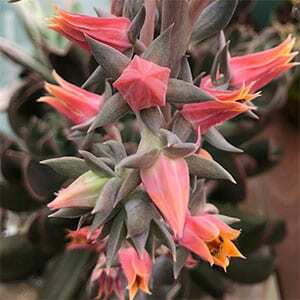 It only requires a little more care than the more common Echeveria varieties. Good drainage is essential to prevent fungal problems. As the foliage forms a dense cover, right down the stem, it is best to top dress the growing medium with a layer of small pebbles or coarse grit. This helps ensure that the foliage is never sitting on moist soil. Good air circulation is also important. Equally important is protection from to much hot direct sun as, strong filtered light is recommended. Choose a position where it gets good morning sun and filtered afternoon light. Adjusting the amount of light will determine the foliage colour. 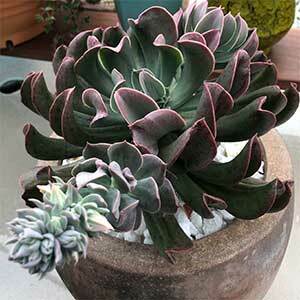 Like most Echeveria ‘Dark Vader’ will produce offsets or ‘pups’. These are the easiest form of propagation and can be removed once they reach a good size. It is also possible to propagate older plants as they get taller by removing the whole head, letting the stem callus over and replanting. The old stem will usually reshoot and new plants can be propagated from these new shoots. Another new cultivar worth looking for is ‘Topsy Turvy’.